Searing steak in a pan before gently oven cooking it, results in juicy, succulent meat. 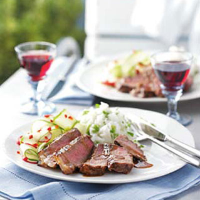 A marinade with oriental spices adds extra flavour. Score a crisscross pattern onto the surface of the steak on both sides. Place in a food bag with all the marinade ingredients then seal and refrigerate for at least 2 hours. To make the salad, remove the cucumber skin using a Y-shaped peeler. Discard. Peel the cucumber into ribbons, discarding the seeded core. Place the cucumber in a dish with the radish. Mix together the sugar, vinegar and chilli, and drizzle over the salad. Season, cover and chill until needed. Preheat the oven to 180C, gas mark 4. Add the oil to a non-stick griddle pan or frying pan and heat to smoking point. Add the steak and cook for 1-2 minutes on each side until just chargrilled. Transfer the steak to a small ovenproof dish, pouring over any remaining marinade, and cook in the oven for 8 minutes for rare, 12 minutes for medium rare and 15 minutes for well done. Cut the steak into slices and divide between two plates. Serve with the cucumber salad and Thai rice with coriander.